One of the many unique similarities my sister shared with Travis Alexander is that she was raised by a Grandmother. When our mother got sick, my father being in his early 30′s with three children under the age of six, needed help. He called upon his mother who literally dropped her entire life and moved in with us. He moved us all from our idyllic life in Florida where we were all born back to Illinois where our mother was from. We haven’t discussed these things in detail, it’s hard for my dad , but it’s always been my belief that she wanted to come home to die. Maybe I don’t ask because it’s hard for me to know these things. My mother spent most of the last months of her life in a hospital in a city 150 miles away from her children. I remember her coming home for brief periods then going back to Chicago to the hospital. Children weren’t allowed in the hospital back in the 60’s so my last memories of my mother are standing on the lawn outside holding drawn pictures up for her as she looked out a window high above. We lived in a huge rented house in the small town of LeRoy where my mother grew up. My sophisticated Grandmother who’d lived in New York City her whole life was transplanted to a tiny farm town much like a spinoff of Green Acres. It would be funny if it wasn’t so sad. After our mother passed, our beloved Grandmother stayed on and lived with us for five years. My father was her only child so we all were her life. Obviously she was with us in the most formative and traumatic years of our lives. I remember feeling so awkward in second grade that I came home one day and asked her if I could call her “Mom”. How devastating that question must have been for her. In those days there just weren’t “single parents”. When our father remarried about seven years after we lost our mother, our Grandmother moved back to her home in New York. I remember this being a crushing loss for all of us. Yet we always stayed close. We went to visit her every summer and stayed with her for weeks. 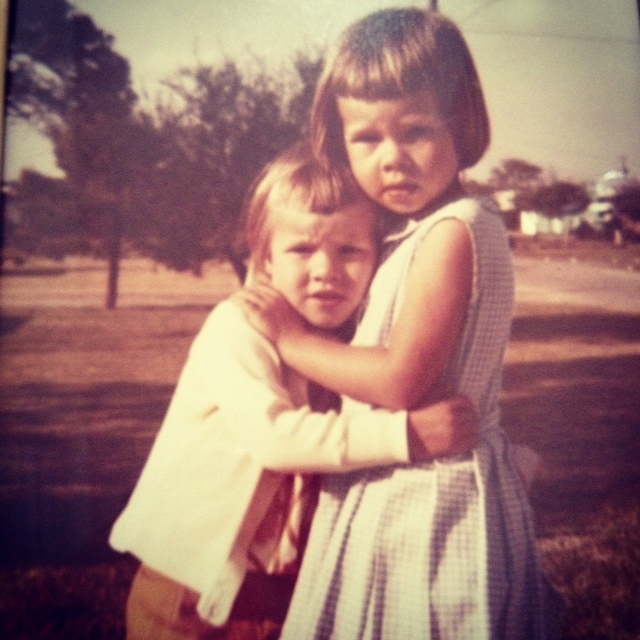 As we became adults, Cindy and I traveled all over the place with our “Buddha” as we’d nicknamed her along the way. She would winter here in Arizona staying with one or the other of us after we’d moved out here. Then she would head over to Santa Monica for the rest of the Winter and Spring. Cindy and I visited her every March for her birthday in California in this little quirky hotel she stayed in on the beach. She would get the adjoining room for us and we all had a blast exploring things like tapings of daytime shows (Cindy ended up as a contestant on The Price is Right one year! ), looking for the stars homes and wonderful dinners out all over LA. We loved our Buddha like an older sister in many ways. We pampered her and she pampered us. She had a childlike spirit all the way throughout her life which you can see so clearly in the photo above during one of Cindy’s famous “let’s dress up for no reason” parties. 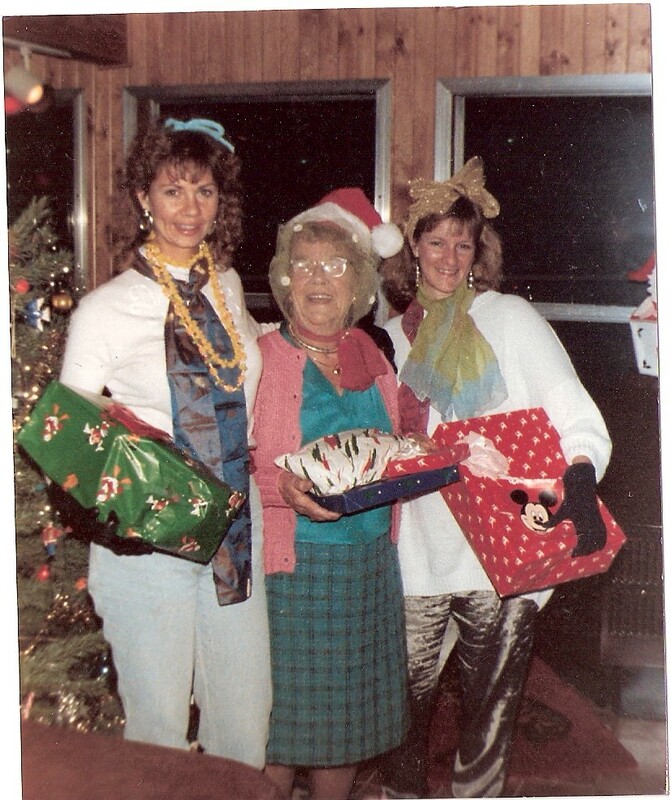 That photo was taken at Christmas 1987. The last one we were all together. The following year Buddha, now living on her own in a condo in Connecticut, had fallen and broken her hip. She was 87 at that time and other than the hip injury was going strong. When I flew home, during the hours Cindy had been designated a “missing person” , it had already been decided that for the first time in our lives, our Grandma Buddha would not be with us for Christmas. She just couldn’t travel. I arrived home to the four of us- my brother, Dad and stepmother- hoping that word had come in from Cindy during my flight time, to nothing. I don’t remember much from those hours. I do know we sat in the same room you see in the photo above – an addition my father had put on the back of the house that housed a huge jacuzzi, plants, a gas fireplace and of course our big Christmas tree. We sat there, mostly silent, just waiting for anything. And hoping. Praying. Desperate. It was Christmas Eve day 1988. I do remember at about 2pm or so my father saying “we’d better call Grandma as she’s going to wonder if we don’t call her on Christmas Eve”. It would have been a couple hours later in the East. So he and I decided to call her and just act normal, say nothing, not worry her there alone, needlessly. I don’t know where I mustered up the strength to talk to her like that. I was 29 years old, panicking, desperate and I had to talk to my Grandma like nothing was wrong. I remember her being so happy as always to hear from us. She was completely lucid and clear as always and cheerful. As Cindy had been ambivalent about coming home for Christmas that year (her murderer we now know was trying to stop those plans as he had his own forming) , Buddha asked me “did Cindy decide to come?”. I answered “No Grandma she decided she couldn’t make it this year so you see you’re not the only one not here”. And her response to that is something I’ll never forget. Something she never forgot through the rest of her life. “Well she called me this morning”, she said. My mind began racing in a million directions yet I had to remain calm and not seem as affected by those words as I was. “She did? What did she say Grandma?” I managed to whisper out trying to hide my shock. As of that morning, Cindy had been missing for over twelve hours and her face was plastered all over the morning news back in Phoenix. My dear Grandma replied “all I could make out was ‘Hi Buddha!’ and then the phone went dead. I asked the girl here to call her back for me and I got that German man and I couldn’t understand a word he said”. My Grandma never had a confused moment in her life. She knew Cindy and my voices as distinctly as she knew her own. No one on the face of the Earth referred to her as “Buddha” other than the three of us. Ever. Since I was the last one to talk to Grandma that day, I went straight to my Dad with this news. Of course none of it made sense. This was before the days of cell phones. We knew Cindy didn’t have her purse. It was doubtful she’d had this temporary rehab facility’s number memorized. Why would she call Grandma if she’d been kidnapped and could make contact with someone? But it was a glimmer of something through all of the silence. I remember feeling hopeful and full of doubt at the same time. My father said “well if she’s made some kind of contact, we need to call the police back”. We found out that day that by the time Buddha had received that phone call, Cindy had been dead for at least fifteen hours. My Grandma went to her grave thinking her beloved first born granddaughter had made contact with her on that Christmas Eve as she was up there all alone and would need comfort. I believed it too. I believe it still. I truly believe it too. Some things just happen but can’t be ‘explained’ in the normal sense of reality. Wow what a wonderful gift for your Grandma and a bittersweet memory for you. Thx again for sharing. This made me cry. I’m so sorry for the loss of your sister. I believe your Grandmother did hear from Cindy that day, I really do. Wow! That is one beautiful story! You have the knack girl!! Yep, Kleenex again. You need to write a book. She DID call her, no doubt. Love. Oh my goodness. I am very glad for your Buddha that she had that comfort. I totally believe there was contact made. Sometimes, just not explainable in our terms. Your Buddha would need the comfort most at that point. You had your Dad, Stepmom and brother. Interesting to look back in retrospect. Bravo for your sheer guts and courage to relive this and put it out there. Many are being helped. Just know that. I got chills reading this. I believe your sister did call Buddha. No doubt in my mind. I’ve read your story and I’m convinced that you are one of Gods angels put here on earth to help others going through what you went through. Only someone who has endured pain like that could help others going through the hell of having their loved one taken on a level that would truly help them heal. They see you and think “there is hope, I can survive this. I can get through) you are like a light in the darkness for people who are going through something that is everyone’s worst nightmare. God bless you Katie and keep you strong. Such a beautiful story. That choked me up. She DID call. Your gift of sharing is remarkable! I feel we are being the ‘gift’ of what will turn out to be your book. Love the connection of you, Cindy and your Buddha……and how special it was…and no doubt how it continues to this day. There is a Love’s truck stop up in LeRoy on I-74 that I stop at when I’m coming through to fuel up at. Now I’ll think of you and your family when I’m there! OOOhhh Dear Heart you ARE a ‘Treasure’ . . .
From your writings, it appears your entire family has and had the gift of Grace. I believe that Cindy did some how contact your Buddha. Katie, thank you for sharing on this blog. And yes, I love and agree with the mention of the gift of Grace in the comment above. Bless you Katie for sharing this, I too have no doubt, absolutely none. As another wrote, “bittersweet.” There too is a sense of awe and wonder, maybe a question of why because we don’t know how, exactly. And maybe that doesn’t matter, only that this truly happened and it will never be forgotten, that need to reach out and connect, still. Even in the here and now. Some things just can’t be measured. You are so inspiring!! Love. I believe. Thanks for your courage to share with us all. Also, a beautiful affirmation to those of us who share such an experience. Albeit a devastating, life altering day, the love you all share(d) shines off the page. So beautiful. I am hooked on your story and how you bring me in as if I know you and your family. Thank you. That is so amazing Kathy! So beautiful. I have read about people getting phone calls from their loved ones who have passed. So like you, your Buddha and everyone else up here, I believe it, too.